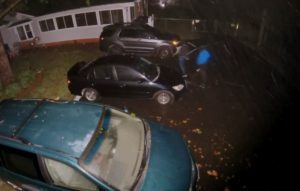 On Tuesday, September 11, 2018 during the early morning hours, several people called 9-1-1 to report two subjects attempting to break into cars in the Bancroft and Eutaw Forest neighborhoods in Charles County. Officers responded but did not locate anyone. This is the only video they have at this point. One of the suspects is wearing a bright blue jacket and the other is wearing a dark jacket. This is a reminder of why it’s important to remove valuables from your vehicle when leaving it unattended, especially during the overnight hours. Anyone with information about the suspects is asked to call Charles County Crime Solvers at 1-866-411-TIPS. We thank the residents for calling 9-1-1 right away to report the suspicious activity and we believe their calls prevented the thefts. Note: In this video, the suspects simply looked inside the black passenger car and the gray SUV. This entry was posted on September 13, 2018 at 9:17 am and is filed under All News, Charles County Crime Solvers, Charles News, County, Crime Solvers, Law Enforcement, More News, z 600X120 Top Ad Bottom, z 600X120 Top Ad Top. You can follow any responses to this entry through the RSS 2.0 feed. I would bet these savages are from P.G. County since they are so close to the county line. They’d be shot and be a missing person if they got caught by a homeowner down here in the 7th. The 7th what? Circle of Hell? EVERYBODY knows its 7th district. I suspect only those who actually suffer there know that.